with stark spires and ghostly hoodoos eroded out of the red limestone and sandstone. 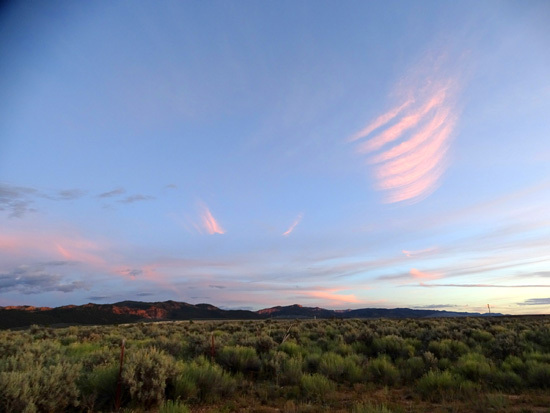 provide a gateway to the splendor of Bryce Canyon National Park." After all our frustrations finding suitable places to spend time on our way south to Arizona for the winter, we feel like we won the lottery at Red Canyon, Utah! 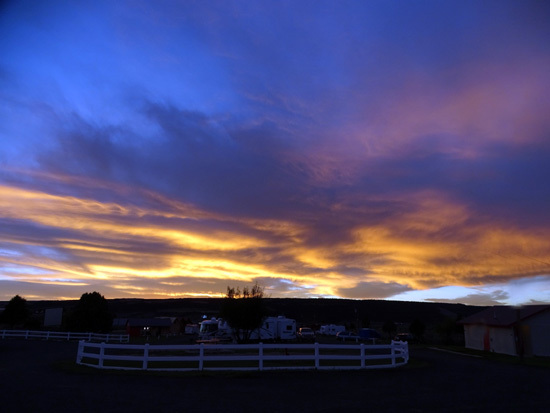 Red Canyon and this RV park aren't perfect, but no place will ever have everything we want. Or will it? Maybe that's one of many reasons we keep traveling around North America . . .
Scenic Route 12 has a lot going for it. Here's a rare moment with no traffic close by. We decided within a few days that we wanted to stay at least a month here. 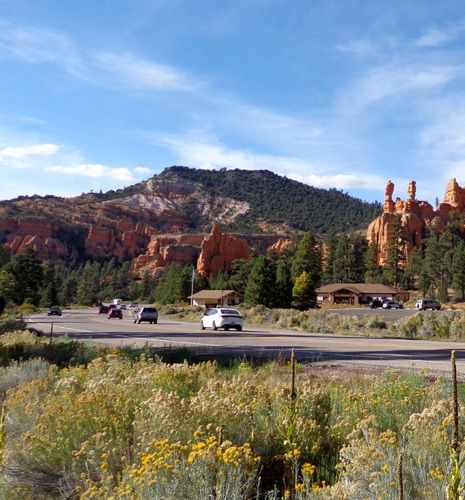 In retrospect, we're glad we weren't able to get a site at the nearby Forest Service campground in Red Canyon. There are no hookups and the time limit is two weeks. We couldn't have done nearly all we've done in that short of a time period. For the past eleven years most of the entries on this website have been dated when the particular activity actually occurred. At other times I've done more of a summary after the fact. This is one of those periods of time when I need to organize our activities by topic rather than chronologically so it's less repetitious and just makes more sense. You can see the list of activities -- hikes, bike rides, day drives, etc. -- on the topics page even before I get them written. 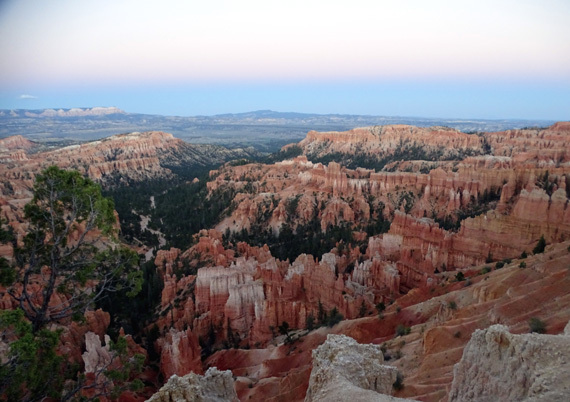 It was interesting to see Cedar Breaks Natl. Monument with and without snow during our stay. It's harder for me to present the entries this way because I can't just copy most of what I've written in my daily journals but it'll be easier for readers to pick and choose the topics that interest them. 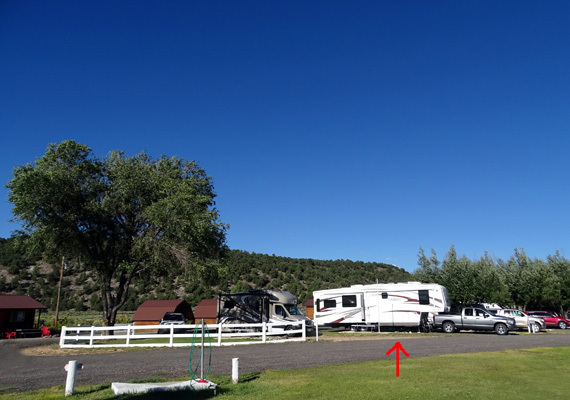 So although this entry is dated September 18, it covers our stay in this RV park from September 17 to October 18. We didn't want to leave that soon because it was still so hot at our winter destination in north metro Phoenix. Despite continued business, the owners decided to shut 'er down for the winter on October 18. They would have done it sooner but we'd already paid through that date. 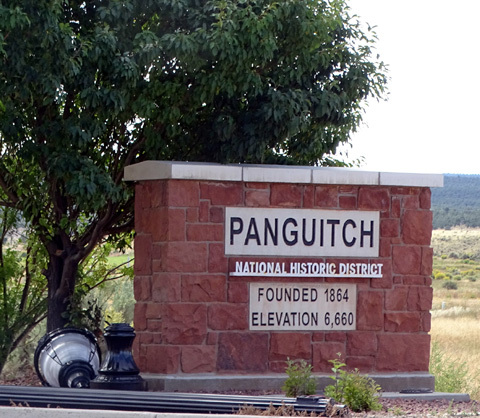 In this entry I'll also include activities we did in the town of Panguitch about eight miles away. There were several other places we considered visiting on our way from here south -- Zion National Park, Kanab, UT, Jacob Lake and the north rim of the Grand Canyon, Grand Staircase-Escalante National Monument, Vermillion Cliffs, Paria Canyon, Flagstaff and the south rim of the Grand Canyon, and other possibilities. We found so many things to do in Red Canyon and nearby Bryce Canyon National Park, however, that we just didn't want to leave! We drove over to Bryce Canyon the first evening we were here, and many times thereafter. This is Trail Heaven whether you run, hike, bike, ride horseback, or have a motorized off-road vehicle (dirt bike, ATV, etc.). Most of the trails in the national park are restricted to foot travel only but various trails in Red Canyon are open to various modes of travel so everyone has lots of miles they can cover. 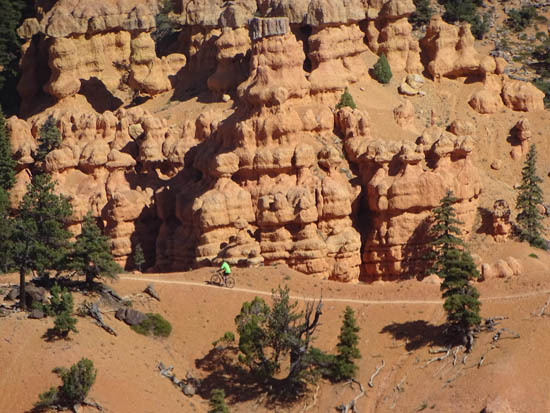 I'll go into detail on almost every trail in Red Canyon and Bryce Canyon in subsequent entries. The scenery is simply stunning. I covered a lot of territory on foot in 31 days and took thousands of pictures! Jim was very happy to have a terrific paved bike path that runs about 23 miles from Red Canyon to inside Bryce Canyon NP. The beginning of the bike path is only about two miles from our campground. 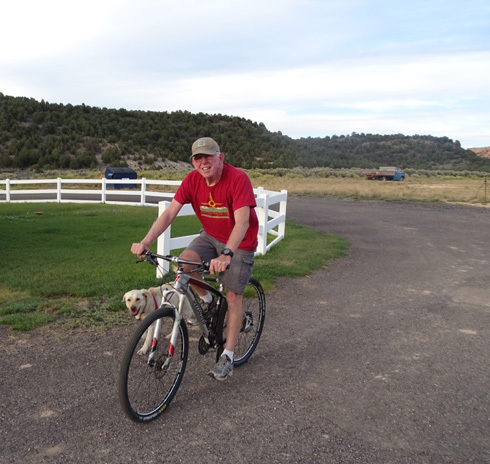 Jim could ride Casey on any of it, as well as roads and streets in nearby Panguitch. He also found a nice grassy area at the edge of town next to some horses where they liked to play ball. The campground is 17 miles from the entrance to Bryce Canyon National Park, close enough that we drove up there two or three times a week. 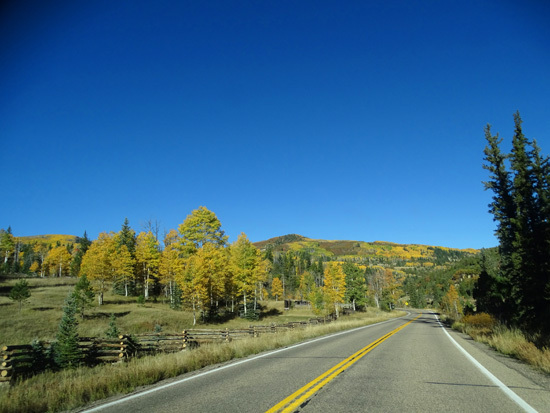 It's also in a great location to do any number of scenic day drives to other national parks, national monuments, state parks, and just beautiful canyon country. 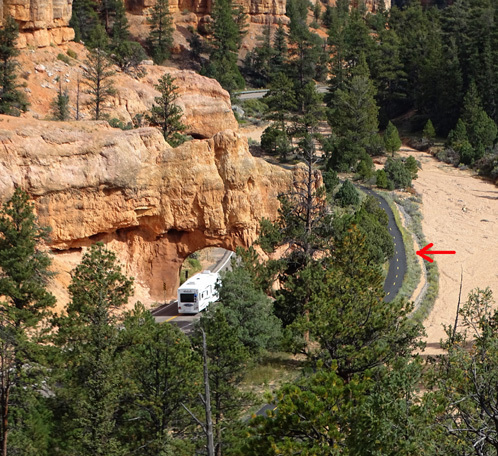 The bike path (arrow) is close to the road near the two tunnels in Red Canyon. The weather was mostly great the whole time we were here, as you'll see from many of the photos in upcoming entries. Temps were quite pleasant (average of 40s overnight to 70s during the day) and we had lots of clear, sunny days that we wanted to bottle up for later. We had some rain and chilly temps but not enough to say, "Let's go!" like we did the last week in Alaska, through Canada, or in the Tetons recently. We even got to see a blood moon one night (more about that later in this entry). 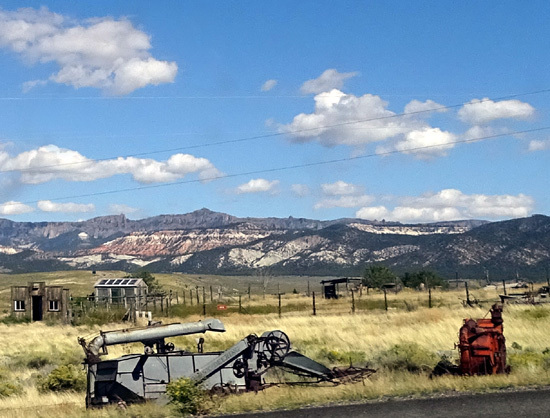 One of the downsides of being in a somewhat remote area was the long drive for shopping in Cedar City, the nearest town with a Walmart, Home Depot, Lowe's, and other major stores. There is no Sam's Club or PetsMart there but it had most of what we wanted, including a good Thai restaurant. We drove over there at least weekly. Panguitch sorely lacks even a decent grocery store. 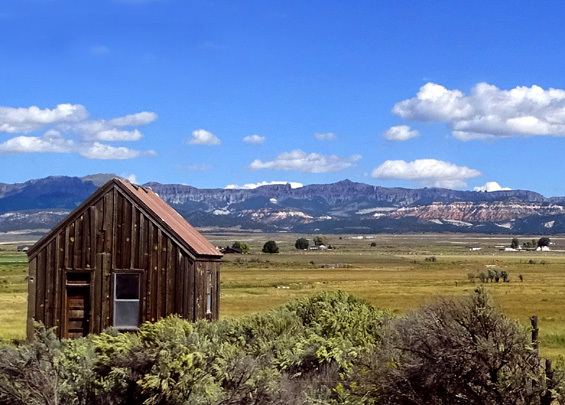 "Cedar," as the locals call it, is a 60+-mile drive south on US 89 -- that part is fast -- then up and over the high Markagunt Plateau (elevations to 10,000 feet) on Hwy. 14, a State Scenic Byway. Because of the mountain curves it took about 90 minutes to drive each direction. The good thing was that it was so doggone scenic! 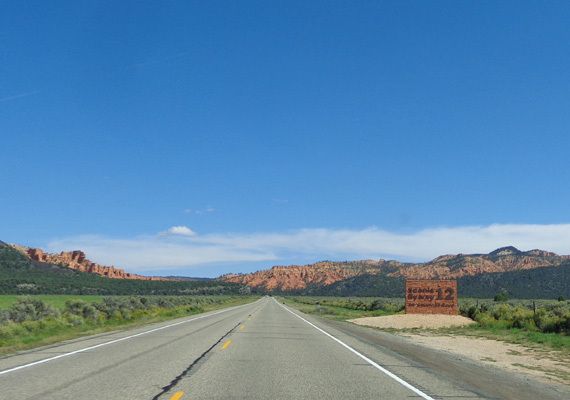 In the winter, or with an RV, it's definitely better to go north on US 89, west on UT 20, and south on I-15 to reach Cedar City from Red Canyon or Bryce Canyon but we didn't go that direction during this visit. It was just too pretty, albeit slow, via Scenic Byway 14. We really liked this campground and the friendly, accommodating staff who run it. 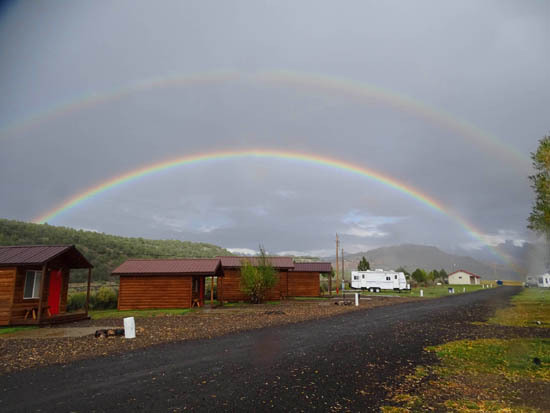 The same company (Forever Resorts) also owns several cabins behind the RV sites and a store with a gift shop, rocks and minerals, Indian artifacts, clothes, moccasins, accessories, and some food items. 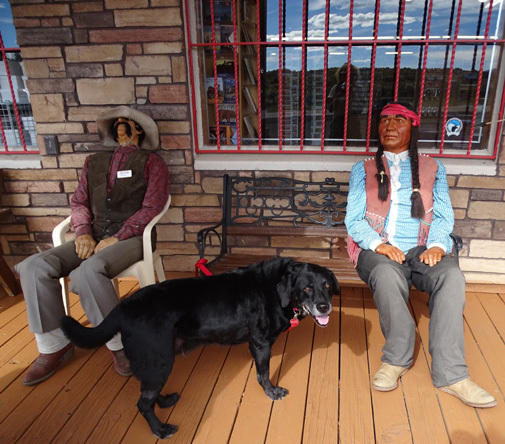 The most fun thing about the Red Canyon Indian Store & Rock Shop is the fake people. 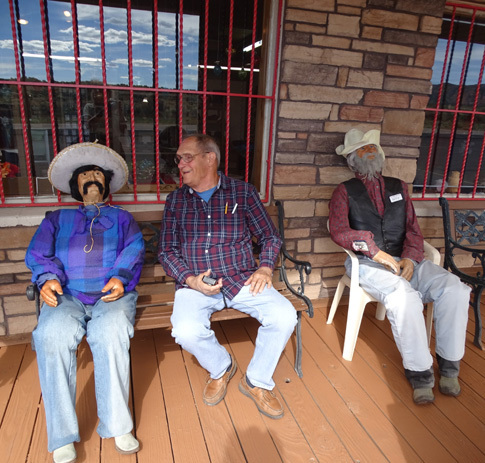 Every morning the staff sits four Indian, Mexican, and cowboy "mannequins" in seats on the porch, inviting people to laugh and pose with them, if they want. When my brother visited, he had to do that, of course (photo above). I'm surprised Jim didn't do it, too. Hey, ya gotta have some kind of hook to snare some of the many tourists going by . . . 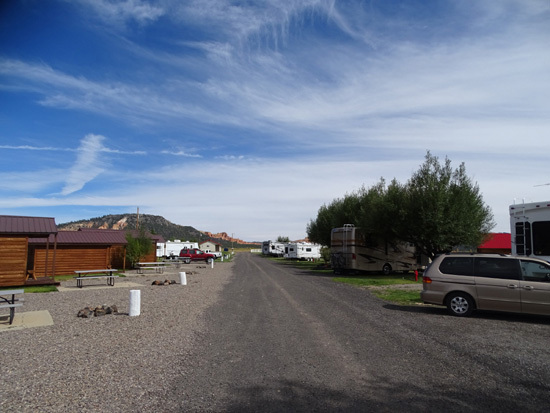 The RV park has about seventeen long pull-thru sites. Most can accommodate big rigs, although trees in a few of them might prevent folks from opening slides on both sides or putting out awnings. There are also about eight back-in sites and a few grassy tent sites next to a covered pavilion. Some of the single cabins and back-in sites are visible on the left; pull-thru sites are on the right. 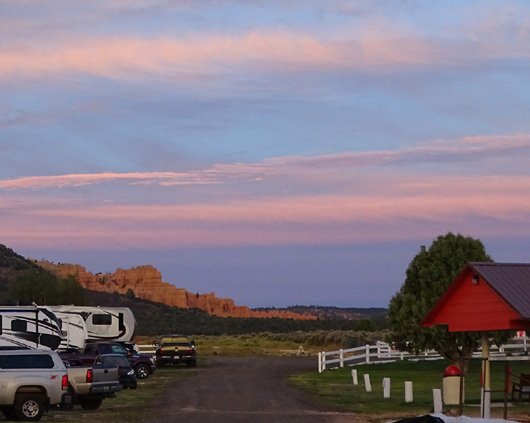 the campground; red rocks near entrance to Red Canyon are visible in the background. The RV sites are either paved or gravel. Ours is sort of paved, with grass on either side and enough room in front of and behind the Cameo for our truck and car. 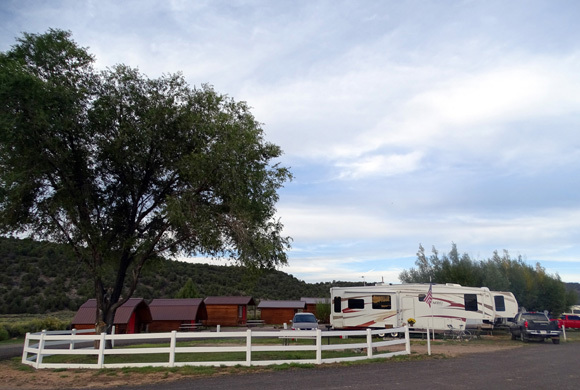 Unlike some RV parks and campgrounds, this one does not charge an additional fee for an extra vehicle and there are other places where folks can park a boat or trailer for a toad, if they don't want them at their site. were longer but we had a stronger WiFi signal across from the office so we stayed put. 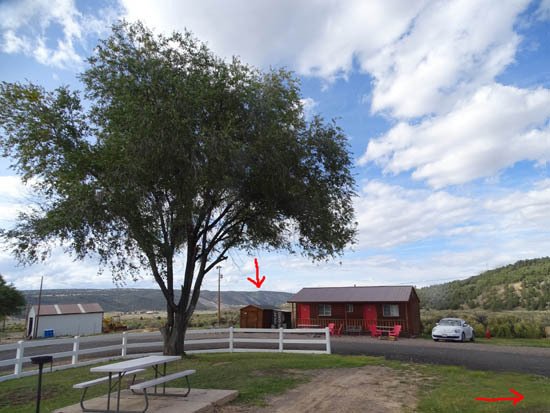 The pull-thru sites have 50 amp electricity, water, sewer, cable TV, and -- if you get a spot close to the campground office like we did -- excellent WiFi. Our Verizon phone signal is strong here so our private MiFi is, too. The arrow at the lower right points to our site. Fortunately, it was sunny here most of our stay and we were close enough to see when the washer and dryer were in use before walking back a hundred feet to them. Even though we could do only one small load at a time, and the washer had only cold water, it was lots better than hauling dirty clothes, linens, and dog towels to another location. I don't believe there's a Laundromat in nearby Panguitch, just another RV park with some washers and dryers. Anyway, all this -- and proximity to so many great places to hike, ride, and visit -- for only $500 a month = an effective rate of only $16.67/day. That's less than some of the military RV parks where we've stayed for a month or longer, quite reasonable for a private business in a popular tourist area. The regular daily rate is $39 (less 10% Good Sam or other discount). There is a "fall special" daily rate of about $28 now. The weekly rate is $150 with no discounts ($21.43/day). We initially paid for a week, extended it another week, then decided to stay 31 days. The staff graciously billed us for the monthly rate of $500 plus an extra day at $16.67. What a deal! We appreciated that gesture because they could have kept charging the weekly rate. We're used to this procedure at military bases when we've extended our stay (e.g., Kings Bay Sub Base in St. Mary's, GA during the winter) but I think it's the first time a private RV park has been so accommodating. 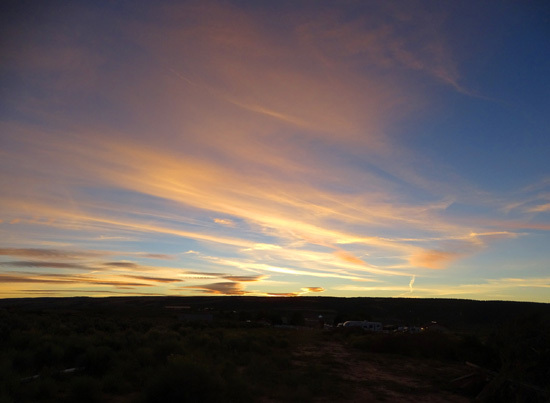 We have expansive panoramic views from our camper or the campground in general. Like much of Montana, this is also "Big Sky Country." We can see everything from storms in the distance and beautiful sunsets to rainbows and red rocks. where I walk the dogs is in the background. Red Canyon is in the background, east of the RV park. There are cows grazing in the sage-filled fields adjacent to the cabins. The fences aren't kept in good repair so sometimes we get cows in the campground. Very large rabbits are rampant and the dogs usually find their poop pellets -- great for snacking, Casey and Cody say! While we were here we got to observe a fairly rare occurrence -- a blood moon. The full moon on September 27 was the closest to earth that it gets so it looked larger than usual. This occurs once or twice a year. This time the full moon also coincided with a total eclipse. That hasn't occurred for 30 years so there was plenty of hype about the phenomenon. I don't remember ever seeing the "blood moon" when it looks red during the eclipse so I hung out in the meadow east of the campground to watch the eclipse for about an hour. We missed the first half of it because of clouds. Then the moon rose above the low clouds and I could see the second half disappear. 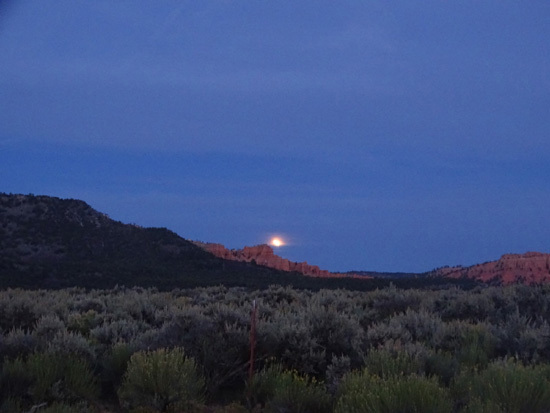 It appeared red for several minutes until the moon started to show more of itself again. I got cold and returned to the camper after about an hour. I didn't get any good photos during the event. Jim just popped out of the camper every few minutes to watch the progression. The five home-schooled kids three sites over from ours came out to the same area in the meadow where I was sitting/standing and it was fun talking to the younger ones while we were watching the moon. They range in age from 8-19. They're smart and articulate. They've been on the road with their parents for two years, traveling all over the country. The father has some sort of computer job he can do while they travel. Their home in TN is up for sale and they plan to be traveling for another year or two. They are just one of the very interesting families/couples we've met in this campground and on our hikes and bike rides in the area. Visitors come from all over the world to see our phenomenal national parks. Talking with folks from Alaska to Australia and everywhere in between (or beyond) is one of the great pleasures of RV travel and an active lifestyle. Several nice cabins are located along the fence line behind the RV sites at the lower (western) end of the campground. There are two adjoining cabins with queen-sized beds, chest of drawers, TV, bathroom, a table and chairs, a microwave, and small refrigerator. I showed the building in the photo with the outdoor laundry, above. Those "equipped" cabins rent for $90/night. Near the end of our stay my brother and his wife rented one of the larger cabins for several nights. Although the price seemed high to us, they said it was reasonable based on other accommodations they had on their cross-country drive from the Midwest to the west coast. It was nice to have them right behind us. 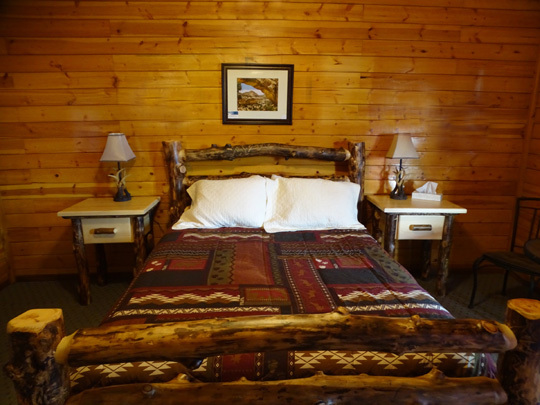 Six smaller individual cabins with just a bedroom-sitting area are only $25 to $35/night. The campground has men's and women's bathrooms with showers for those who need it. Three other larger cabins with lofts and bright red roofs are in construction, right by the road. They are partially shown in a photo farther above on this page. WHERE ARE ALL THESE PEOPLE GOING?? 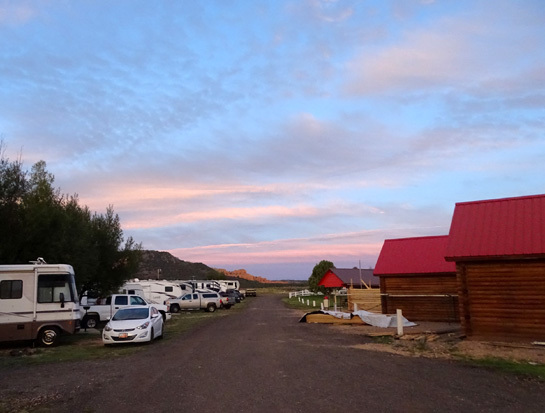 The main downside to this RV park is being so close to very busy UT 12, a National Scenic Byway and the route everyone has to take to reach Bryce Canyon National Park and all the scenic wonders along its 124-mile length. It's amazing how many large construction and other trucks travel this winding mountain road, as well as tour buses, RVs, and all sorts of passenger vehicles. 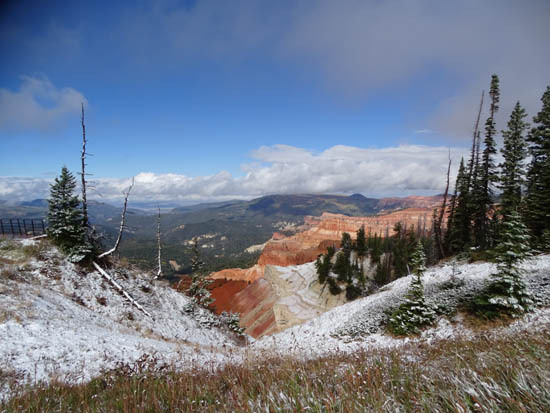 Bryce attracts almost two million visitors a year, and it seemed like they were all here this fall! The noise level would have been the same if we'd gotten a spot up the road at the Forest Service campground -- it's as close to the road as Red Canyon Village. The campgrounds in the national park would be much quieter but they also stay full 24/7, so good luck getting one of those spots. The only other downside for us was that the campground closed a couple days after we left on October 18 because it was getting down to freezing at night. The elevation at our site was about 6,900 feet so winter will soon be here. It's already been snowing some above 9,000 feet in this area. 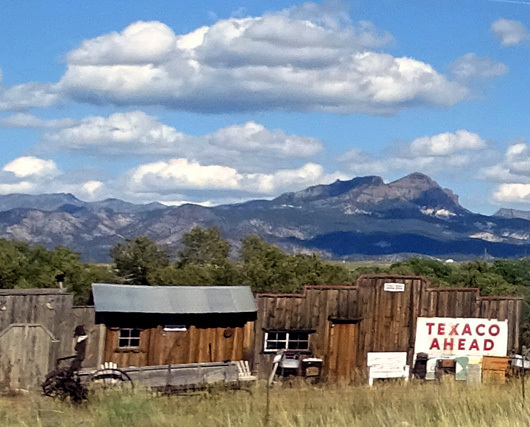 This small town of about 1,700 people is located at the junction of US 89 and UT 143, a National Scenic Byway. 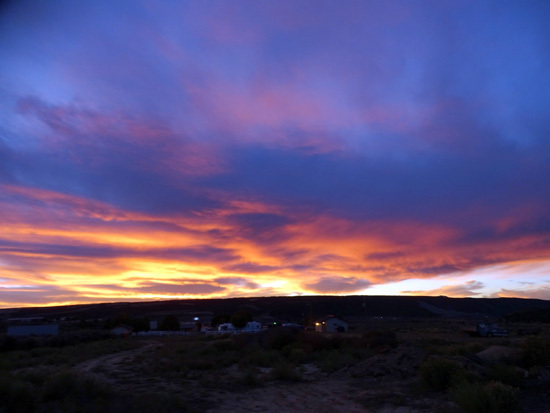 Panguitch is the closest town with a grocery store, Post Office, gas stations, and other services that visitors to Red Canyon are likely to need. It is about eight miles from our campground. 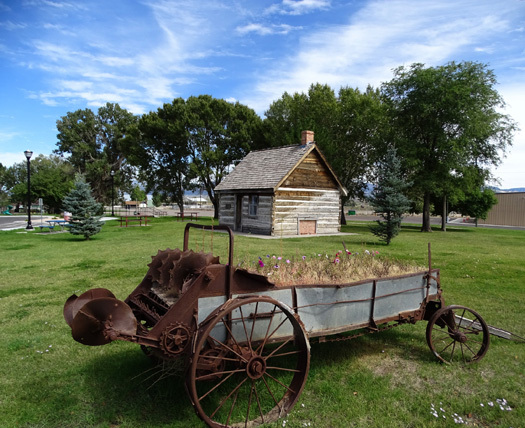 There is another little park in Panguitch that commemorates an interesting historical feat, the Quilt Walk. 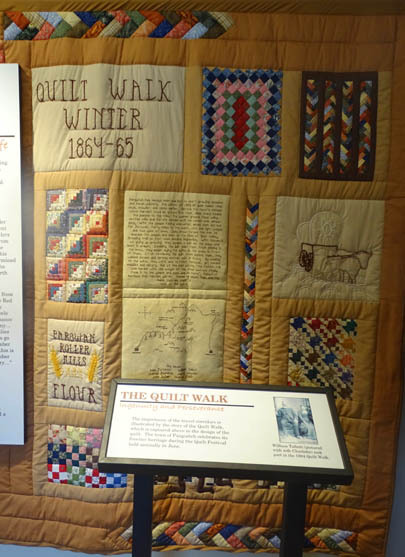 I first learned about this unusual trek at the Red Canyon Visitor Center, which has a display to honor the seven brave pioneers who laid quilts on top of the snow so they could cross the mountain range between Parowan and Panguitch in 1864 to deliver flour to the town's starving populace. 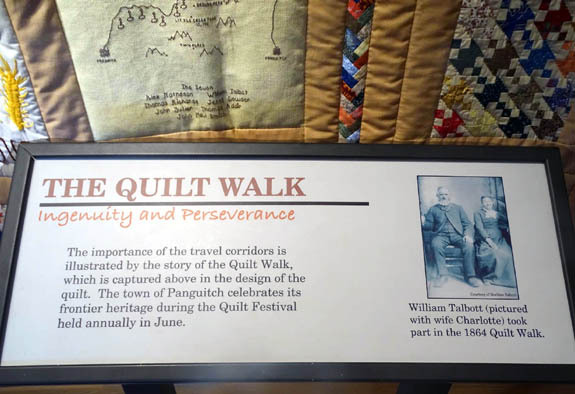 An annual Quilt Walk Festival in June honors the men who accomplished this feat and celebrates the town's frontier heritage. Jim went into town several times a week for groceries, gas/diesel, the post office, Subway, and to run Casey with the bike. 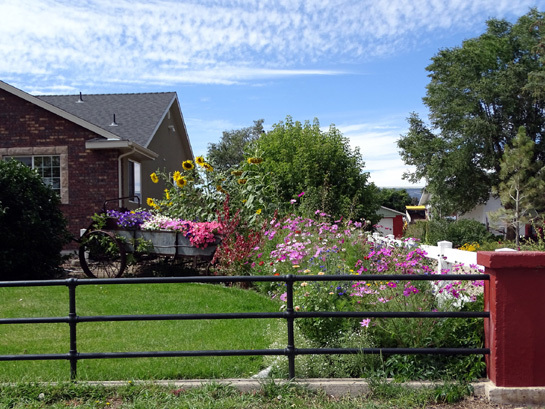 The residential streets were safe places to ride with her and gave her some variety instead of just running on the bike path between Red Canyon and Bryce Canyon. He also found a grassy area next to a horse meadow where he played ball with Casey. For folks who don't travel in RVs, Panguitch has motel rooms and B&Bs. 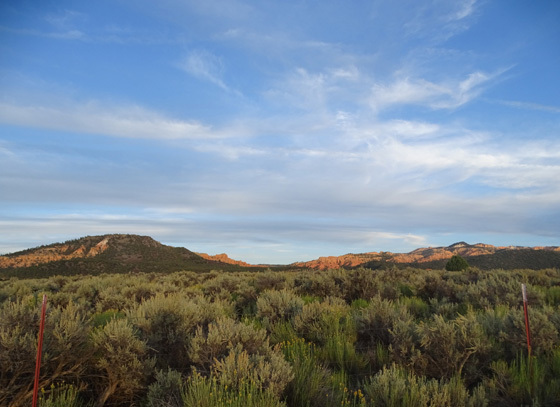 It's almost as convenient to all the national and state parks, national monuments, recreation areas, national forests, and lakes as Red Canyon.